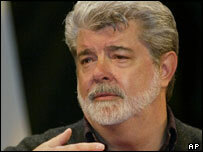 Two Star Wars TV series will follow the latest movie in the hit film franchise, director George Lucas has said. Animated show Clone Wars, currently broadcast as three-minute episodes, will become "a 3D animated" series of 30-minute shows, he said. It would be followed by a live-action series featuring characters from the six Star Wars movies, he added. "We're probably not going to start that for about a year," he told a Star Wars convention in Indianapolis. 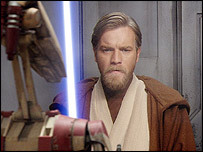 The latest Star Wars film, Episode III: Revenge of the Sith, is released in most countries on 19 May. The Clone Wars "micro-series" has had 25 three-minute episodes on Cartoon Network, taking the story up to Revenge of the Sith. Mr Lucas told the Celebration III convention the live action TV series would be similar to Raiders of the Lost Ark spin-off The Young Indiana Jones Chronicles. "Like on The Young Indiana Jones Chronicles, we want to write all the stories for the entire first season all at once," he said. "I'm going to get it started, and hire the show runners and all of that, then I'll probably step away." He said the live action series would feature stories taking place between movie episodes three and four - Revenge of the Sith and the original 1977 Star Wars movie. Lucas said he "never considered" extending the Stars Wars story beyond episode six - Return of the Jedi. "To be very honest with you, I never ever thought of anything that happened beyond episode six," he said. "It's the Darth Vader story. It starts with him being a young boy and it ends with him dying. I never ever really considered ever taking that particular story further." Mr Lucas said the live action series would feature some existing Star Wars characters - but would not elaborate. "There's a lot of issues that are connected, but you won't necessarily see a lot of the people that are connected," he said. No broadcast dates for either series have been announced. More than 30,000 fans attended the convention. Away from Star Wars, Mr Lucas added a fourth Indiana Jones movie was "definitely in the works". Meanwhile, The Empire Strikes Back has been named the favourite Star Wars movie in a poll of more than 40,000 readers of film magazine Empire. Han Solo was voted the favourite hero, Chewbacca was top alien and X-wing pilot Wedge Antilles was favourite minor character.